The last several years in my country there has been a string of fraud that involves people, claiming to be police, asking citizens to contribute large sums of money to aid "police investigation". The cases persist even though news about it is all over the place, leading me to presume that the whole operation might be targeting people that suffer from a specific mental condition. When I was a child, there was this kid that you could trick literally any number times in a row, the same thing, in a sequence, just seconds apart, and it would fall for it each and every time. This memory leads me to presume that there is indeed such a condition, and that the aforementioned fraud operation targets people with that condition, so I was wondering if this kind of behavior is studied and documented. EDIT: The answers so far focus on trust, which is understandable, since I did say "gullible", and it is an omission of my own that I didn't mention it in the initial post, but in many of those cases there is also an element of intimidation immediately prior to the request to "help catch the criminals", which probably plays a significant psychological role too, slightly expanding the context beyond just "unconditional unfounded trust". Using magnetic resonance imaging (MRI), the scientists were able to determine which parts of the brain govern a person’s ability to identify sarcasm and lies. The images revealed the associations between the deteriorations of particular parts of the brain and the inability to detect insincere speech. The frontal lobes are strongly associated with complex, higher-order human thinking; thus being unable to detect a lie is only one of several ways the disease may manifest itself. Early symptoms may include any number of differences in behavior, including acting out in socially inappropriate ways or experiencing fundamental shifts in beliefs — changing political views or religions, for example. As such brain-damage related phenomena, sometimes accidental or neurodevelopmental versions are found, but they are usually rarer. Recent efforts to redefine mental retardation (MR) have been based on the belief that invented scientific criteria, e.g., IQ and adaptive behavior, are insufficient to diagnose a disorder which over the centuries was diagnosed on the basis of intuitive prototypes (Greenspan, 1997). In this chapter, we argue that a central aspect of the MR prototype which has been largely overlooked in recent conceptualizations is a tendency toward unusual credulity and gullibility. In our view, it is credulity and gullibility, as much or more than deficiencies in daily living skills, which cause people with MR (and, for that matter, other forms of cognitive impairment) to be viewed as "disabled" and, perhaps, in need of protections such as conservatorship arrangements. Constructs related to deficits in social intelligence are credulity and gullibility. Greenspan, Loughlin and Black (2001) defined credulity as ‘a tendency to believe something, usually a highly questionable statement or claim, despite scanty evidence’ (p. 102) and gullibility as ‘a vulnerability to being tricked or manipulated’ (p. 102). The authors stated that the two constructs are very closely related in that the presence of credulity invariably leads to a gullible outcome and that, while a tendency to be trusting may generally be a good and stable attribute, survival in the social world requires an ability to discriminate those occasional situations where compliance or agreement may result in an adverse outcome. The authors state that low social intelligence and specifically high credulity and gullibility may lie at the heart of poor social outcomes for children and adults with AS (Greenspan et al., 2001). Table 1 shows the items and their factor loadings after rotation. The two factors relate to getting tricked into things or bullied (factor one) and believing others’ statements to their own detriment (factor two). A Pearson’s correlation revealed the two factors were moderately correlated with one another, r = .519, suggesting that while related they are different enough to be two distinct factors. 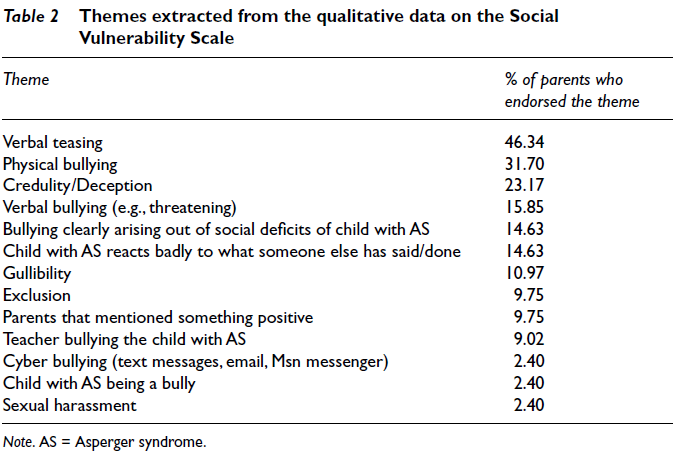 However despite this statistical feat, the number of Asperger's children who were outright identified as gullible as fairly low, around 11% of the sample; credulity was more widespread at 23%. Other areas that were mentioned by more than 10% of parents included credulity or deception:‘believes everything other kids say, even if it’s wrong’ and ‘has watched TV and insisted that we buy something because the salesmen said “you must buy this”’; [...] and gullibility ‘today J threw a girl’s hat on the school roof because another child told him to’ and ‘told to jump in the school fish pond’. Specifically, the first factor (gullibility) contained victimisation items and the second factor contained both credulity and gullibility items. Consequently, these findings raise doubt as to whether the two-factor conceptualisation of social vulnerability described by Greenspan et al. (2001) is applicable to children. 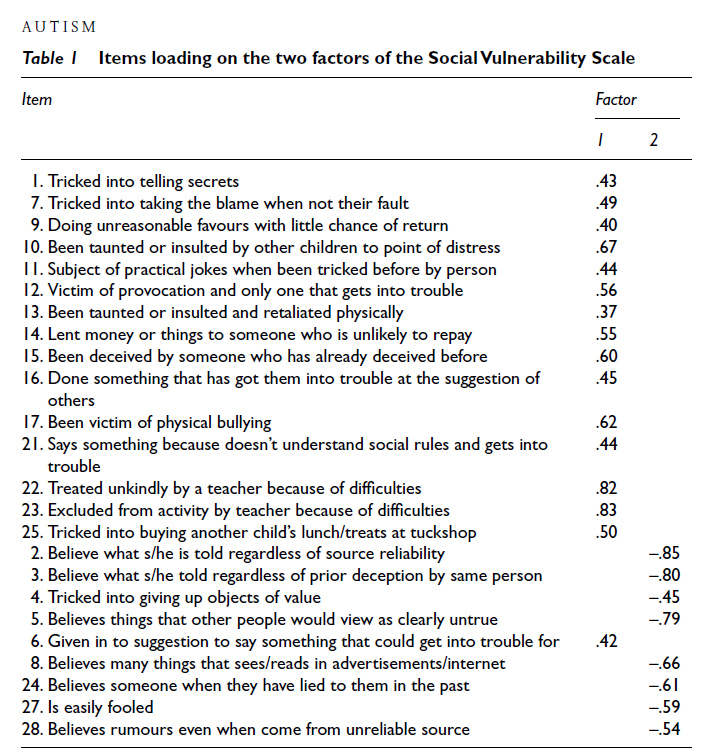 The two-factor conceptualisation of social vulnerability (i.e., credulity and gullibility) proposed by Greenspan et al. (2001) did not emerge in the current study, even when a two-factor solution was forced, despite having items clearly representing both credulity and gullibility and a large sample with considerable variability. Rather, our results indicate that credulity and gullibility are part of the same factor, suggesting that the theoretical conceptualisation of social vulnerability described by Greenspan et al. (2001) is not applicable to children. 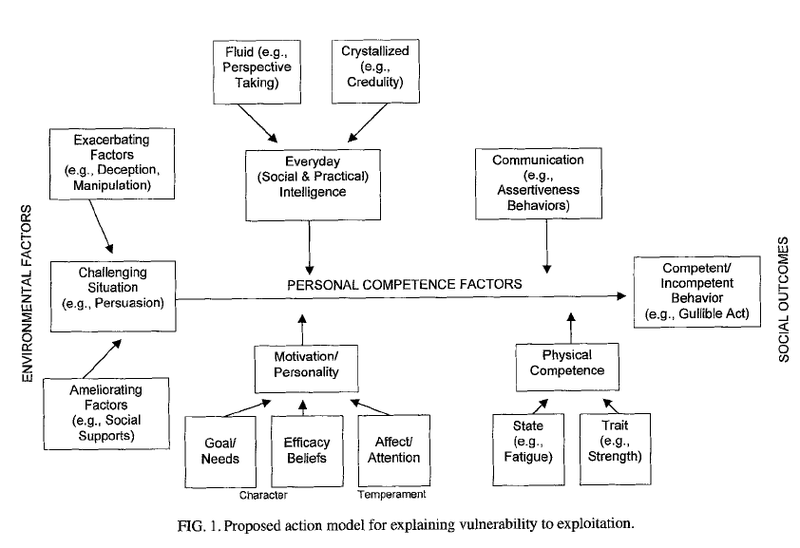 It is possible that, for children, social vulnerability is a unitary construct, and that as individuals develop, the construct becomes more complex and delineates into two factors (credulity and gullibility) as seen in older adults (Pinsker et al., 2011). Further research conducted across the lifespan will be required to determine if this is in fact the case. Interest in other were seen as well in the Help Others domain, with both the Williams and Prader-Willi groups showing "strong desires to help others" and being "very happy when others do well". The Williams syndrome group, however was singularly high in the item "feels terrible when others are hurt". Reis (1998), in a study of young adult women with Williams syndrome--a chromosomal disorder associated with mild or borderline MR--- found that virtually 100% of them had been sexually abused by male peers or workers. Dykens (1998), confirming this finding, has attributed it to the extreme need to please which is an aspect of the Williams syndrome behavioral phenotype. While such affective and motivational factors undoubtedly are very important (see the multidimensional model depicted in Fig. 1), it should not be assumed that social-cognitive factors, such as credulity, are irrelevant. There is considerable research (Dykens & Hodapp, 1998; Rourke, 1995) suggesting that social deficits in people with various syndromes are typically more significant than their academic deficits. Furthermore, the tendency to think of social competence primarily in terms of agreeableness may blind observers to the very real social intelligence deficits of individuals (such as most people with Williams syndrome) who are extremely affable and verbally facile. And about the news stories... scamming the average person by phone is easy enough without access to health records and the like. The Bulgarian cases reminded me of the Taiwanese located in Spain or even Kenya scamming mainland Chinese with a scheme in which a caller pretend to be police asking for help. Larry’s need for support [from a neighborhood association] stemmed from his extreme gullibility, and the threat that this posed on numerous occasions to his wellbeing. Specifically, Larry—who lived alone—was very lonely, and he tended to befriend homeless people living on the street. He would give them keys so that they could use his bathroom or sleep in his apartment, would agree to give them money (when he barely had enough to make it through the month), and was even persuaded, until someone intervened, to run off to live under the boardwalk at Coney Island with one of his homeless friends. Aside from the costs to Larry (such as having his meager possessions repeatedly ripped off ), the presence of these strangers in the building—many of them with criminal backgrounds or severe mental illness—was very upsetting to Larry’s neighbors, who feared both physical damage to the building (e.g., a shower left running in Larry’s apartment caused major water damage) and for their own safety. Thus, the decision by Larry’s neighbors to create a “circle of friends” was motivated not only out of affection for him but also because they saw it as an alternative to his eviction (which had been considered at one time) and as a way to protect themselves and Larry from his own gullibility, a gullibility that reflected his cognitive limitations as well as his strong social neediness. “When emotionally aroused, either excited or frustrated, older adults may be more susceptible to being victimized by scammers than are younger individuals,” says Ian H. Gotlib, professor of psychology and author of a new report from the Center on Longevity at Stanford University. This gives a much simpler way for scammers to profile their targets. Studies show that the elderly – individuals aged 60 and over – are targeted more frequently by financial fraud and scams than other age groups. A recent MetLife Study of Elder and Financial Abuse found that in 2010, $2.9 billion (yes, that’s billion with a B) was stolen from the elderly through financial fraud, scams, and exploitation. Additionally, research conducted by the Federal Trade Commission found that 80% of telemarketing scam victims are over the age of 60. Williams Syndrome is not, strictly-speaking a purely mental condition. It is "caused by a genetic abnormality" and commonly leads to problems "with teeth, heart problems, especially supravalvular aortic stenosis, and periods of high blood calcium". But, Williams Syndrome does lead to incredible levels of gullibility. People suffering from the condition are easy to mislead and trick, due to their universal friendliness (even to total strangers). An example from one of the WB-cited stories was that WS people are known to over-draft their bank accounts buying lunch for their coworkers. In your specific case, it would be easy to tell if WS were involved, since it is associated with a very distinct set of facial features. Not the answer you're looking for? Browse other questions tagged social-psychology abnormal-psychology fear trust or ask your own question. Are there emotions that only some people can feel? What makes people easily subscribe to pseudoscientific theories? Is there a name for highly aggressive non-violent people? Does a mental disorder exist where people think someone else is sick? Is there evidence or indication that highly sensitive people (HSP) can feel elektromagnetic waves?